A search query can trigger a range of listing types, these all fall into one of two categories. The first of these categories is called a paid listing. These are paid ads that appear in the SERPs, you need to pay Google through their software called AdWords to have your ads show for specific keywords. 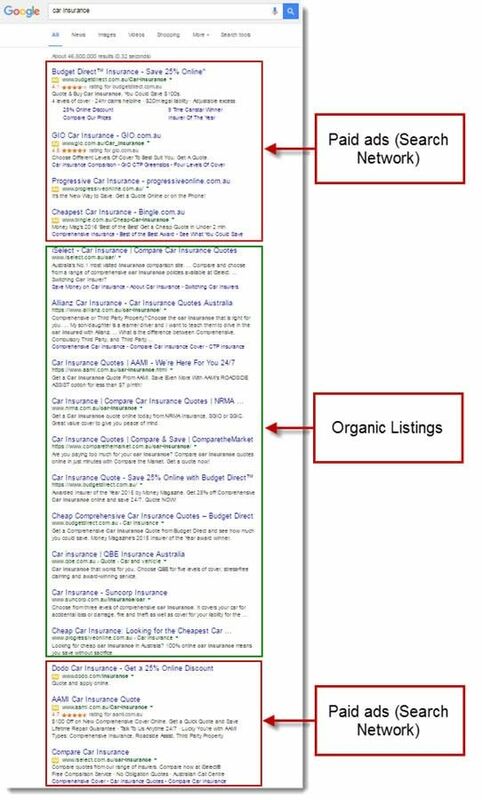 More often called ‘paid listings’ than ‘paid SERP listings’, these are not part of, and have nothing to do with, SEO…. So why mention them? Well, they are a significant part of the SERP landscape, these listing often appear at the top of the SERPs. You need to be able to identify these as being irrelevant in order to know what to ignore, as if you are learning about SEO, you will see paid ads at some point. These listings come in various shapes, sizes and flavours, to learn more about this, please visit our PPC knowledge base.